It's Thursday, and I think we all know what that means. First, let me introduce my co-host this week. Maria and I just recently found each others' blogs, and I think it was love at first read. Too cheesy? Anyway, she's a lit-loving, eccentric blogger, and her style is unique and of very good quality. It's the blog you've been looking for, basically. So, go check it out. Do you ever pick up a book on your shelf, that you've already read, and just read it again? Is that something people do? Is it weird that I have never done this? Seriously, I have some favorite books, and I have been known to just pick up a book I love, turn to a random page and read a line or two...like saying Hey to an old friend. But I have never taken a week or more out of my precious reading time to read something that has already made its way through my brain. For the record, I understand the appeal. I have favorite movies that I enjoy watching for the 77th time. I have favorite music that I play on repeat rather obsessively. But I just cannot justify reading a book that I have already read. In my defense, I know that I should. I have heard people say that they discover something new each time. And that it's like hanging out with your best friend again. And why wouldn't you want to dive back into a fictional world that is so fantastic? Why not do it, at the very least, to be able to brag that it's your favorite book, you've read it over 5 times. However, like any good book fiend, I have a humongous to-be-read shelf. I already have my next 5 books planned out. And there's plenty more where that came from. Unlike most book reviewers out there, I don't read at lightning speeds. I take 1-2 weeks per book, and I'm off to a rough start in 2013. I've only finished ONE book so far. *hanging head in shame* I have reviews and deadlines and spicy sequels to get to. I don't have time to relive The Quarter Quell again. Plus, I already know what happens. Won't I be bored? School is the only reason I have ever re-read anything. Curriculum is repetitive, and I've read Romeo and Juliet, Hamlet, To Kill A Mockingbird and Lord of the Flies no less than eight time each. I have to say re-reading The Giver with ten years between did not mean I enjoyed it anymore in my adult years. I still stand by the assertion that it's one of YA's best, but the magic was lost the second time around. Obviously, I'm being absurd. I really do want to re-read some of my favorites. That is, after all, the reason they are still on my bookshelf. I love having them in the room with me, like companions. I do have the best intentions to pick them up again. I keep saying I will do it, but people keep publishing new books and there just isn't enough time. But I hate to think I'll never see Hazel and Augustus again. So, how about you? Is there an old favorite you've been dying to relive? Or are you like me and never re-read anything? Put some Sesame Street on for the kids and join us for some book chattin! I'm still looking for co-hosts! We have openings for co-hosts in March. Email me, if interested. Oh yeah, before I forget, the winner of The Mad Scientist's Daughter was Chantal of Scattered Seashells! The irony of course is that we live on the same post and have yet to meet in person. Now, we have an excuse. Thanks to everyone who entered. I will try to do more giveaways in the future. Books and albums and that sort. 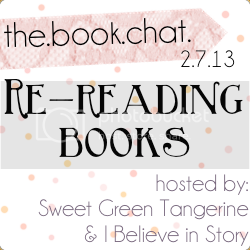 The Book Chat's 1-year anniversary is coming up, so you know I'm probably going to go crazy with that. I have a heck of a time reading books these days, but recently I re-read one of my favorite books ever and it was worth it. I had forgotten a lot of the details and was able to be sucked right back in. A good story works like that! I've re-read a lot of my books, but it was easier before kids and I had time to really dive into them. This last one took me two months to read... it was nearly 1000 pages though. I like the idea of opening a favourite book and re-reading a page or two. I often write in/highlight my books (shameful, I know), so sometimes I'll open a favourite and look for passages that I've noted before. I understand about curriculum being repetitive. I've read Conrad's "Heart of Darkness" more times than I ever want to admit (it's probably my least favourite book of all time) and I completely agree about The Giver - it isn't any better a second time around (or maybe it's just not as magical when you're older?). I'd also like to re-read The Night Circus, but I only just read it a couple months ago, so I'll be holding off on that for quite awhile. If you really liked The Night Circus, I recommend "Of Bees and Mist" by Erick Setiawan. It's sort of a hidden gem, but one of my favourites, and it has those same poetic prose and magical realism elements of TNC. When I first started working at my job, like, the first two years or so of it, I felt the same way as you. I forgot what it was like to love a book so much I wanted to re-read it. I spent a BIG part of my life not knowing enough about books to buy ALL OF THEM and read ALL OF THEM and have too many to go back to favorites... So that's all I did. When I was given ALL THE BOOKS, I briefly forgot about my favorites. But slowly, I pushed myself to start re-reading books that I had let go YEARS previously, and reading them again was, literally, like reading them for the first time- only that picking them up again, your brain started to put pieces together, emotions and feelings you had from the past, and there's just something about that feeling that NO new book can beat, like, ever. I'm not a big rereader, honestly. Like you, I just have SO many other books that I want to get to that rereading something where I already know the story? Doesn't always appeal to me. That said, I have started rereading through one of my favorite series and I'm finding it is well worth the time to dive back into these books and just get that FEELING of reading something you absolutely love again. Sure, I know what happens but that's not the point of rereading. It's about uncovering the magic once again. I cannot, though, ever reread TFiOS. It was such a heartbreaking book and I don't think I could handle the emotions a second time around, especially knowing how it ends! You know, I don't think there was ever a time when I wasn't a re-reader. Even when I was a kid, I had my favorite books that I would always go back to - like certain Goosebumps novels, the Sideways Stories books, or anything by Judy Blume. Like you, I also have a TON of books on my TBR, but when I read, I have to read something that I feel like reading, and if I happen to feel like re-reading an old friend, then that is what I do. Since I started blogging last year, I've found that I've been reading significantly more than I ever have before. Even more-so this year, now that I've entered some reading challenges (I've read 10 so far). While there's a lot out there I'd still like to read, I feel happy just knowing that I'm reading more. I think one of my main reasons for reading is to find new favorites that I'd like to re-visit again. I occasionally will reread. I definitely need to reread The Night Circus! That was such a great book and I definitely think I'd learn new things reading it a second time. I will re-watch movies over and over and just couldn't re-read books either. But then when I would talk about my favorite books, sometimes I can't remember details. I liked what you said about diving back into a fictional world. If it's your favorite book, why not be able to brag you've read it 5 times? That's so true. If it's my favorite, I should be able to remember details. You and the winner live on the same post? How awesome! I posted my stuff this morning and just now realized I didn't link up =) Early pregnancy brain? This topic made me realize how much I really want to re-read some of my favorite books. I don't reread very often because the truth is I don't have time, but I did reread The Time Traveler's Wife this year. It will probably be the only book I will reread this year. Thanks for linking up to It's Freakin' Friday! I am now following you, and I hope to see you next week! It's funny, I mention in my post how I don't feel like I have time for re-reading books, although I did. And how students have asked me what is the point since I know how it goes? I might answer your question. Also, I just realised when you mention The Giver and reading all those curriculum books that I do "re-read" the same books again when I use novels in my class, but I guess I choose books that I enjoy and it's always fun to read it with newcomers and see their reaction to it and it's more of an experience to work with a book than to just read it by myself. I love re-reading books. I like to see if they have a different impact on me as I enter different phases of life. I just re-read the Harry Potter series. I blew through it so fast the first time and I wanted to go back to pick up all the little details. The book thief has been on my list forever. I need to get on it!